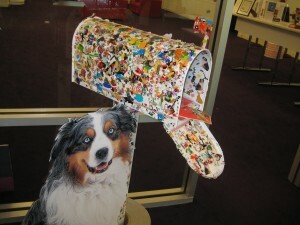 Did you know you can visit a sticker factory in the Bay Area? I was delighted to discover Mrs. Grossman‘s on Twitter the other day. Seeing her name sent me spiraling down memory lane. Those of us that were children in the 70s and 80s were of the generation when stickers become the craze! Did you have a sticker collection? Was the collection in an album? I did! My favorite stickers were Mrs. Grossman’s because hers were the best quality and there were so many choices. I remember saving up my money, going to the mall with my friend and buying the stickers one at a time off the roll, they were .5 – .10 cents each. Then my friend and I would go home add them to our sticker albums and be armed and ready to go to school to show off our new treasures and to do some serious trading. Since I no longer own my sticker album 🙁 I did a Google search and found this blog about stickers. This woman was a serious sticker collector! After discovering Mrs. Grossman’s on Twitter I followed her and found out you can visit their factory for a tour and discovered the factory is right here in the Bay Area! Mrs. Grossman lives right here and her stickers are made here in the Bay Area! How cool is that?! I immediately arranged for a tour. When I arrived for the tour I was greeted by a friendly woman who gave me some stickers and walked me in to the room with the rest of the tour (I was a few minutes late). I joined the group and sat and watched a video about the history of Mrs. Grossman’s. I learned Mrs. Grossman has a dog named Angus who is the customer service representative of Mrs. Grossman’s. The first sticker ever made for individual sale was the big red heart. Mrs. Grossman’s favorite words are “I love my job” and everyone that worked there seemed to really love their job. Mrs. Grossman’s son Jason who is now the president of Mrs. Grossman’s. He launched Pargaon Labels (a division of Mrs. Grossman’s) in 1988, it is one of the most successful wine and food label printing businesses in the County. It was also Jason who began the tour idea. 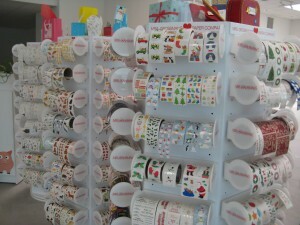 The sticker factory tour attracts more than 30,000 visitors a year. If you live in the Bay Area or are visiting and have small children this is a super fun thing to do. Actually, you don’t even have to have small children, if you are a kid at heart or just want a walk down memory lane I highly recommend going for a sticker factory tour at Mrs. Grossman’s. On Friday Nov 6 Mrs. Grossman’s heart stickers will star in “How It’s Made” on the Science Channel! After the tour I met with Barbara Morino, the PR gal at Mrs. Grossman’s. 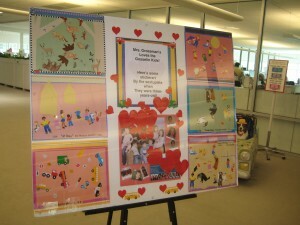 She was delightful and shared many storiesabout Mrs. Grossman’s stickers saying, “Mrs. Grossman’s is like the Tiffany’s of the sticker”. I even found out that Princess Diana bought stickers for William in the 80s. Even the Gosselin kids love Mrs. Grossman’s stickers (you know Jon and Kate’s kids). As you can see, I’m very excited about my visit to the sticker factory. I could go on and on about how fabulous my experience is but this is something I think you should try for yourself. The tour is free, your kids (and you) will come home with some cool stickers, you will get to see all sorts of neat machines that do amazing things and you will meet lots of happy people who love their job. I’m off to go play with my new stickers. I learned that stickers aren’t just for kids and are not just for collection. 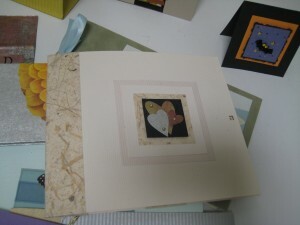 You can make some very sophisticated things with stickers (cards, gift bags, etc). 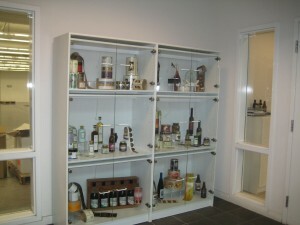 You can decorate office supplies, drinking glasses and so much more. I took so many pictures I uploaded them to Flickr so you can see all of them. 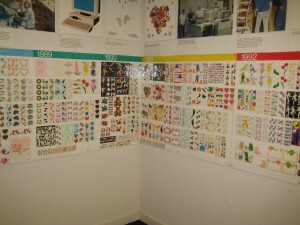 Mrs. Grossman’s has a wall of fame showing all the stickers ever made from 1979 until now. You can see photos of the wall of fame here. Mrs. Grossman’s is located in Petaluma. Check their Website for tour dates and times. You can also follow Mrs. Grossman’s on Twitter and become a fan on Facebook. I’d love to hear about your memories of stickers. I’ve noticed that almost everyone woman I told about my visit to the sticker factory got nostalgic and shared some great stories with me. Do you want some Mrs. Grossman’s stickers? Post a comment below about a memory you have about stickers and I will send you some Mrs. Grossman’s stickers. To get the stickers you must post the comment before 10/31/09 and email me your mailing address (please write stickers in the subject). Be sure to tweet about your sticker comment too! I LOVE Mrs. Grossman’s stickers!! Yes, I had my album and carried it with me everywhere…if we’re being totally honest here, I had multiple albums. I can remember being in school and trading stickers with my friends. Our favorite saying after we traded stickers was, “touch black no trade backs!” Oh the memories! Thanks you so much Sally for linking my sticker blog in your wonderful article here. I am honored, truly. I am also just amazed and was even drooling for a quick second there over the many things that you got to see and so kindly shared with us. MissMidie – I loved Unicorn stickers too! Yes stickers are for sticking but I understand your frustration at wanting to move them around. Thanks for sharing your fun sticker collection online with us. Becki – I think it is so cute that you carried your album everywhere. I’m just picturing young Becki walking around all proud with her sticker album. I don’t remember having stickers when I was younger. Don’t think they were around “back” then…but as an adult I absolutely LOVE LOVE LOVE stickers! Sometimes I love my stickers soooo much I cannot seem to give them away and have some of my favories stuck to the edge of my computer or around my bulletin board. I even have sparkly butterfly, hummingbird and rose stickers decorating my motorcycle helmet! I love how they sparkle in the sunlight! But I now realize I need to go just for ME!